I've heard it said often enough in the past that a gentleman's equipment doesn't function quite so well as he gets older but I didn't think it was his camera gear they were talking about. My Rollei SL66 is out of commission until I get someone to remove the small piece of metal I stupidly dropped behind the shutter curtain, the Leica M2 has a shutter that's only semi-functional and now my OM2 is doing an impression of a double stroke M3. That's three of my favourite cameras all needing some attention. Thankfully, the Olympus is still working of a fashion. When I wind on, something is obviously slipping meaning that I have to do two sweeps of the film advance lever. Other than that, I haven't noticed any obvious problems as a result. I did wonder about frame spacing but it seems to be OK.
A quick look around the web revealed that it's not an uncommon issue. A photo-net discussion on much the same topic featured some input from John Hermanson, the respected Olympus repairer from www.zuiko.com. He told the poster that some new parts might be needed to sort out a similar-sounding problem but, since I paid £35 for the camera including a 35mm Zuiko, it's really not worth spending a lot of money getting it fixed. Encouragingly, John also said that using the winder or motor drive on the camera effectively bypasses the problem area so this sounds like the route I'll be going down (see above pic - it's happened already). I'm hoping the problem isn't going to get any worse, especially after Monday night when I took what I think will be a nice pic. I was a bit cheesed off sitting at home for some reason so went for a wee drive in the Saab. We'd been out on Thursday for a day trip with my mum and I had a strange collection of equipment in the car. There was the Hexar AF, the OM2 with the 50mm f2 Zuiko, a 35mm Zuiko (I wanted to do a couple of comparison shots to see how the Hexar's lens performed against the Zuiko) and a Tamron 300mm f5.6 SP and 2x SP converter. I don't normally carry anything as long as a 300mm lens but we were heading into deepest Perthshire on Thursday and I know from past experience that there are sometimes spectacular distant mountain scenes to be found and I wanted to be able to reel them in. As it turned out, I didn't take a single photo. I don't know about you but I get photographer's block whenever I'm out with other people and find it well nigh impossible to get into a creative mood. On my own it's as if a switch is thrown in my brain and I slip into a different mode altogether. It's almost Zen-like. In company, this change never happens and I hardly ever see anything as a result. Anyway, back to the 300mm, etc. I was in the country just a few miles away and heading home having failed to catch the sun before it dipped behind some clouds near the horizon. I caught sight of a low level barn with a shiny roof catching the light from the sun as it tried its best to break through the clouds. As I drove past I had a thought that the 300mm would probably be about perfect to frame the barn so I reversed the Saab and fitted the lens to the OM2. It looked promising in the viewfinder but I was only getting a speed of 1/125th and I didn't have my tripod with me. I tried using the driver's window as a support but the camera position was just a little too low and a few blurred blades of grass were distracting in the foreground. If you've ever had an original Saab 900 then you'll know just how substantial the rear hatchback is. I raised it half-way up, sat the camera on it and it was as solid a support as I could have hoped for. 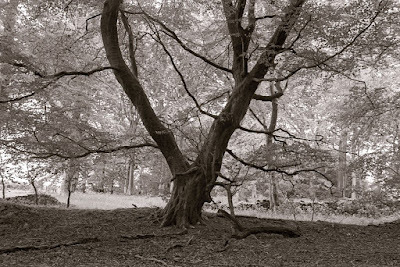 I double-stroked my way to a few frames, bracketing the TMax 400 a couple of stops either side to give me a choice of negatives. It was one of those scenes where I couldn't make up my mind whether it would look better with the barn almost as a silhouette or with some detail in it. I can't remember having ever used the Tamron lens with film although I've shot a few frames with it on the D700 in the past so I'm kind of excited to know how the Olympus shots will turn out. With only about half-a-dozen frames exposed on the roll, I'll need to be patient - and hope that I have a "stroke" of good luck when it comes to the film advance. Bad luck on the OM Bruce - it's not easy is it when things start slipping and not doing what they're supposed to - hope you can get it sorted. While I never had the film advance problem on any of my Olympus cameras (OM-10, OM-2S, OM-4T) I bought a couple of winders as I was shooting some sports at the time. Those winders lasted me over 15 years until I sold them with the OM-4T bodies when I shifted to Nikon (for autofocus). Even with the winders the cameras were lighter than anything else out there and I could keep my eye to the viewfinder and keep shooting. The only Zuiko lenses I ever owned were my original 1,8/50mm and a 2,8/24mm. Nothing like the 300mm you mention here (although I did purchase a Tokina 2,8/300mm to use with my Nikons for newspaper work). can't you get out the piece of metal in the rollei 66 with a nail or sharp object that you magnetise before ? So .... how did the Zuiko do against the Hexar? Tjen - I can't see the piece of metal and it doesn't rattle so I think it must be wedged somewhere. Marcel - haven't done that test yet. I'll get round to it at some point. that transport problem will be getting worse. Most likely it will be the tiny hook-like part wich catches into a gear of the transport mechanism. If you know how to lift off the top of your camera you could either try to bend back the hook and tighten the rivet holding it, or replace the winding gear mechanism. It's held by three tiny phillips screws. Quite easy really. Last but not least you will be able to clean the eyepiece backside and prism surface. After that you'll think your eyes have been reuvenated. Hope you find time to rescue that lovely camera. Oddly I was also driving the roads of Perthshire on Thursday evening too, having run my son up to Aviemore I decided to take the Birnam to Crieff, Stirling route and had an OM4 loaded with lomograph 400 and an ME Super with Tri-X. I'd almost given up as there was too much shadow cast by the hills when I spotted the wee Kirk at Amulree. I had to fight off a swarm of flying ants but there was a gorgeous red-roofed low barn that was picked out by the sun and with the hill behind the kirk was a good subject. I did notice that there was the potential for some interesting sunset with distant mountain scenes developing on the Muthill - Braco road, but unfortunately only had 28 & 50mm lens to hand, so didn't bother to stop. Noticed as I got home that the sun was a gorgeous red ball....wasted opportunity! Nick - you could well be right. John Hermanson seemed to be suggesting something similar. Don't feel bad. My D90 took an unscheduled vacation. Damn. Money is useless sitting around,even in a bank account. Interest no longer compares to inflation (regardless of what the talking head spew) so repairing the camera will happen as soon as the cash is free for it. I refuse to be part of the throw it away and buy new crowd. I'll cry like a little girl the day my F5 cannot be repaired. In fact I'll be unhappy the day it needs repair. Michael,I feel the same. If my Pentax MX's or Spotmatic need repair and there is still someone out there that can do the work,I am more than willing to spend the money. Not so much with anything digital. I felt so proud of myself after having rescued my black OM-2N. Got it for nothing because the transport mechanism wouldn't work. Now it is worth something. To me at least satifactorely, and if I should bother to sell it, it's even worth some money – now. 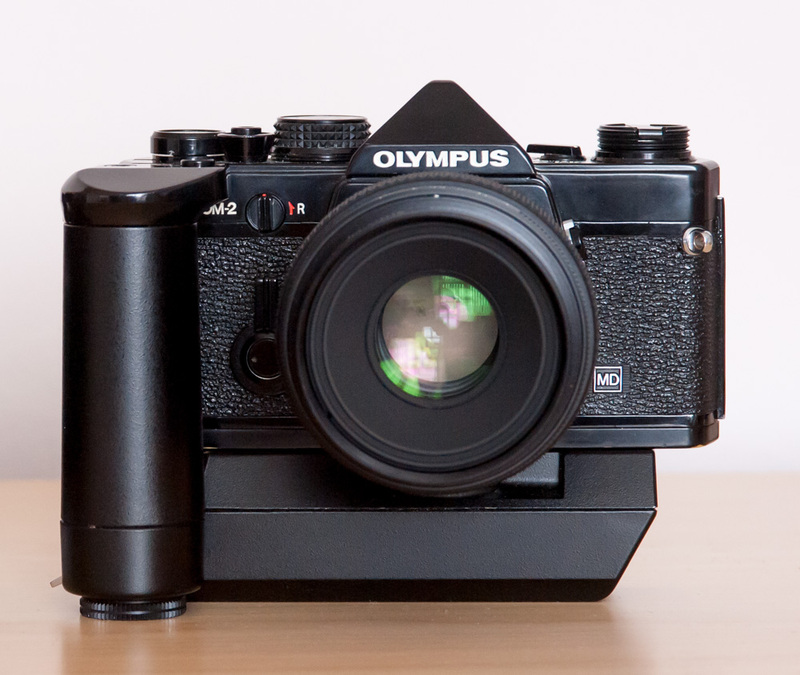 It's not that I don't value the OM2 but just that I could buy two or three on Ebay for the likely cost of the repair. From that point of view it's not worth it. Now, if there were no more OM2s to be found on the secondhand market and mine packed up then it would be a different matter. It's the same for bikes and Saabs: why would I spend £2000 on a car repair if I could get the same model in good order for £1500? Or £400 having a frame repainted if I could buy an already restored frame for £200? I have an OM2n that has a similar fault, bought from eBay it requires a wind of of approx 1.1 which is bizarre, i note Nicks comments and have a question for him, is the repair he alludes to an easy one to do ? and if the spare part is required where does one get said part from. I did manage to get myself another this one's a minter and functions beautifully, I don't mind having a go at repairing the poorly one providing it's doable for a novice so to speak. Hopefully Nick will see your comment and chime in. From my own experience, getting into the film transport mechanism can be quite complicated. If you do a search you should be able to find some exploded diagrams or even a repair manual for the OM2 which should help if you decide to give it a go. Well the repair in itself is just unscrewing the top plate and the transport mechanism. For someone who can dismantle a VW-Bus engine and put it back to work again that is. Unfortunately all of the internetsites that had pictured tutorials about the procedure are gone. So this is goung to be a rather lengthy post, with Bruce's permission. You will need some very good small phillips screwdrivers. An adjustible wrench for the two holed srew holding the advance lever. Dont try to apply the wrench with the black coverplate still on. Soak it with gasoline lighterfuel until it's ready to be lifted off with a toothpick. Just a few drops each soak - and do that prior to anything else. It may take a day to come off. The filmreturn-screw has to be taken off. Take off the door now, before the opening mechanism is off ! Hold the axis with pliers featuring a hole to its jaws by 1/10 less the diameter of the axis. If you can't get or make that tool ( IKEA pliers will do fine as the jaws are not hardened) wrap some leather around the axis. Try not to place a screwdriver through the little gap and force off the rewind screw. You will just tear off the two prongs and will not be able to unwing any film after that. Two small phillips-screws will show now after the rewind-knob is off. Last chance to unhinge the door. If it shuts you'll not be able to open it from now on. Take off flash-shoe. Unscrew the tiny round screw underneath. If you havent got acces to the correct tool, try to make one by cutting a gap into bit of steel plate, or try very fine rounded pliers so you alsways work in the little notches of the srew and don't scatch the top plate. The top plate shoul be off by now and you can see the three phillips screws holding the transportmechanism. You'll need very good fitting durable srewvdrivers for those screws and you have to know how to handle delicate little screws that have not been moved for about 30 odd years. Be shure to have a containment for all the little parts. I taped everything onto a sheet of paper according to where it belonged doing the first time, scribbling small notes to the side or even drawings!. Watch out for tiny washers under the lever or the screw-washer underneat it. These shims will have to be put at the right place, otherwise the lever will not operate smoothely. Do it when nobody else will need the table for two days, so you will not get in a hurry. Make shure to have plenty of good light. Use these to learn taking them apart. It's fun ! The last Repairman in buisness I know of having original spares is OM-Doktor, Frank Timman, located here in Germany. Take pictures as you go along. It has the right names to the tools you need. As I said earlier: I cannot recommend the "tool" to unscrew the rewind knob as given in the video. It should be quite logical to try to use something wich brakes easier than the forks of the axis. And I forgot the aligning of the ISO dial and the switch, the washer on the flash socket and the doormechanism spring. Sorry. I'm just a musician and not a professional blogger on camera repairs. Anybody having gone that far will shurely remove the rotten foam of the prismlightseal. I try not to forget to tip the camera onto its backside or even better upside down while peeling off the loose bits. If camera sits upright the grime will fall into the camera causing more damage than only kill part of the prism silvering. Never touch the surface of the prism while cleaning it with anything harder than a swab of cotton moistioned with isopropyl. Even if the silverplating has been partially lost, if cleaned correctly the glass will reflect a lot of light, as it is highly polished. And you will not notice the defect if you do replace the light seal ! I use lenspaper for that, or as replacement cigarette paper. It works, and will last to the end of film anyway.